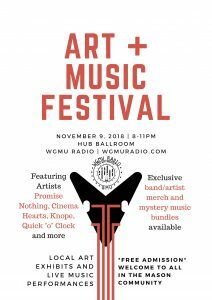 WGMU’s planning to host our first ever Arts and Music Festival on November 9th, 2018 from 8pm-11pm. This event will be held in the Hub Ballroom and will host local bands/musicians playing live and Mason artists who wish to show off their artwork. Musicians like Cinema Hearts, Promise Nothing, Quick “O” Clock and Knope will be performing! Any kind of artwork is welcome – drawings, sculptures, painting, etc.! Because this is our first time hosting an event like this, we’re hoping to have an abundance of artists and musicians alike participate. Artists and musicians will be selling their own exclusive merch and WGMU will be selling mystery music bundles for those looking to get outside their comfort zone. This event will be free for participants and open to the public. If you’d like more information, please email Sasha Toophanie at stoophan@gmu.edu.